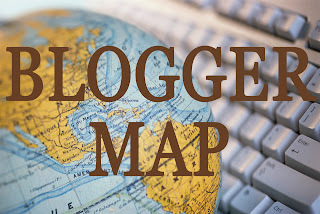 Welcome to my Bloggers Quilt Festival post! Some of you may recognize this quilt I've chosen to share in the ROYGBIV category because a very similar one made by Tracey and her friends was featured in the festival last year! I sent Tracey a block for her quilt and it became my inspiration - not only the design, but also the sentiment - for this quilt. I had the great pleasure of delivering this beautiful quilt to a very special person earlier this week. This is what I've been busy with over the past 5 weeks, with regular updates on Instagram. A mom in our school community received the worst possible news while on vacation with her family in March. She has a long road ahead to regain her health and she needs to know that we are with her all the way. There was a sense of urgency to get a quilt around her brave shoulders, so I put out a call to my retreat customers and fellow members of the VMQG to help. They responded as quilters do: with generosity and grace. I also organized several sewing days around my dining table for mothers and friends in our community so that they could learn how to piece a scrappy sprouts block and put their love and strength into this gift as well. Several women had never sewn before and others hadn't touched a machine in years, but they patiently laid out their blocks and carefully sewed the patches together for their dear friend. 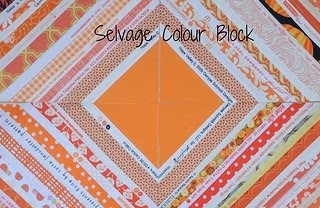 I had pre-cut squares and pre-pieced half square triangles from my stash ready for them to select. In the end I was overwhelmed with the number of sprouts blocks that came in. I couldn't bear not to use every single one, so there's a lovely stalk of them holding up the back. Piecing 74 blocks made by over 30 different people has it's challenges but I was determined to let this project come together peacefully. This isn't perfection of technique, but it is absolutely perfect. In the final layout, a vertical sashing between the columns and a slight offset of each stalk of sprouts keeps things interesting and hides the subtle size differences in the blocks. A sweet purple Dresden just for Deanna - the four full stalks of sprouts represent her incredibly supportive husband and their three amazing boys. The VMQG retreat over the first weekend in May was my opportunity to assemble the top and backing, sandwich this 78" x 82" quilt and complete the quilting. It's quilted with an all-over swirly and looping meander using a gorgeous variegated Aurifil 28 wt in pale yellow/cream/lilac. The backing fabric is a Michael Miller print called Old Script with lilac-coloured cursive text. It's bound with a V & Co. Color Me Happy green bead stripe cut on the bias, plus a little strip of purple Lizzy House pearl bracelets around the lower left corner. I used 3 strands of coordinating lilac embroidery floss to blanket-stitch the label on. There's just something extra-special about this sweet sprout block that makes it the perfect choice for a group-effort comfort quilt. I send a heartfelt hug and thanks to Tracey for allowing me to share her mini-tute for the sprouts block, and the same to every woman who had a hand in the making of this quilt. This quilt is so cheerful and full of hope; it is made with love and just plain feel-good vibes. I know it's already working wonders. Visit the festival at Amy's Creative Side and have a look through the festival links to see hundreds of amazing quilts made all over the world! Amy does an incredible amount of work organizing sponsors, categories and voting twice a year - it truly is the biggest quilt show online! Thank you Amy! Such a beautiful quilt! 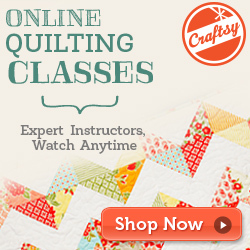 I totally agree that some quilts are not about perfection. The quilt I treasure most was made by friends who were all at different skill levels. It's the thought and love that counts! What a wonderful story of a community effort. I have done very few group quilts, but the ones I have done I have always loved seeing come together. I really liked your label too with the note to her! I just haven't mastered the labels yet. Beautiful! The story is as beautiful as the quilt. I’m sure your friend Deanna will smile when she looks at the quilt. I hope she will fully recover. This is definitely a favorite not only for the beauty of the quilt but the sentiment behind the making of it. What a lovely group of friends Deanna has in all of you. 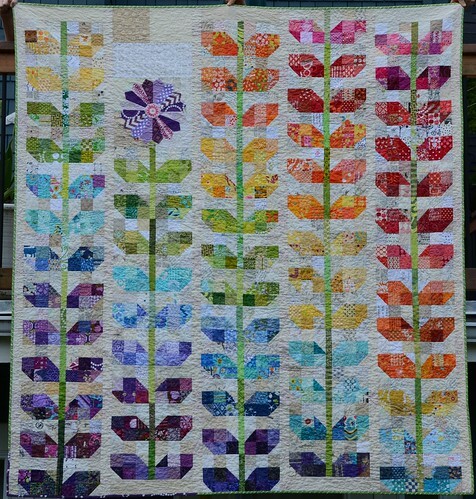 I love this quilt - it's so fresh and fun! A VERY beautiful quilt! I love that dresden flower. Sending positive thoughts for the recipient! Fabulous on so many levels -- so many hands that made it, a great pattern, a few imperfections and variations that make it more interesting, and lots of care and concern sewn right into it. congrats and best wishes to Deanna. What a gorgeous and thoughtful gift for your friend, Krista! I'm sure she will treasure it always! It's just wonderful Krista, and such a touching sentiment. Hoping for comfort for your friend on her road ahead. I couldn't love this quilt any more if I tried. What a wonderful gesture--you have such a warm and loving and giving heart. The purple dresden flower is a genius idea. Sending good thoughts and prayers to your friend. The quilt is as beautiful as the sentiment behind it. Your friend is lucky to have a huge group of loyal and supportive people behind her. And you all recognise that you are lucky to call her friend. It's gorgeous and wishing Deanna the best. Great quilt. All the best to your friend. I think it is great how everyone came together. You are so eloquent! This post makes my heart happy and I know the quilt is making Deanna's heart happy and her journey just that bit easier. You are the best! What a great quilt! Positively gorgeous! I'm certain that the recipient will feel the love put into this yummy gift. This quilt is simply beautiful, as is the love and sentiment sewn into every stitch of it. What an amazingly beautiful quilt ~ not just in the design and color but the love behind and all around it. What a beautiful quilt. I know Deanna will treasure it. You have blessed her. What a great quilt. I am sure it will bring lots of comfort to her. And what a beautiful reason for making it. I'm sure it will be blessing to Deanna in the months to come! This is absolutely beautiful! In every way. such a beautiful quilt - it is sure to bring her comfort and strength. A lovely quilt- the first to catch my eye in the Bloggers Quilt Festival. And I love the back as much as the front! It's just gorgeous, Krista! I'm sure it'll bring her a lot of cheer when she needs it most! Great quilt and story behind it! Well done! Wonderful, what a lovely project. I hope she absolutely loves it and it brings the comfort you hoped for. It is stunning Krista! The dresden was just the right touchand the label is perfect. I'm sure that it will bring her comfort and strenght in the days to come. Good thoughts and wishes go out to Deanna and her family. This quilt is fantastic and such a great story of a community sharing their love and concern. I love both sides, and that backing fabric worked perfectly. What a beautiful quilt. Such a lovely story to go with it. It's beautiful through and through. How precious. It's really lovely and I'm sure it'll provide some comfort and encouragement! What a beautiful quilt and a wonderful story! I love how you brought so many folks together to work on this, and I bet a happy offshoot is lots of your friends who hadn't sewn for a while will get really into quilting now! Beautiful quilt! What a great way to bring comfort to this lady. 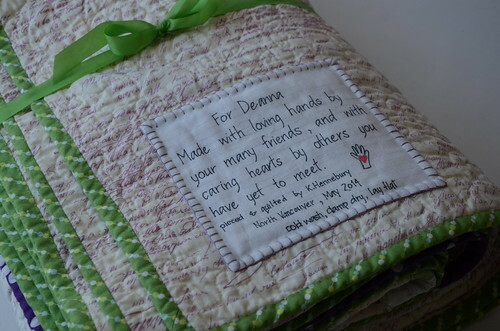 Just thinking of all the people who contributed to the quilt will bring warmth to her heart. Great work! 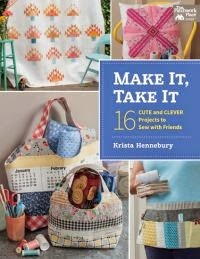 This is a very fun quilt, well done and so fun. Beautiful! Congrats on winning the color category! 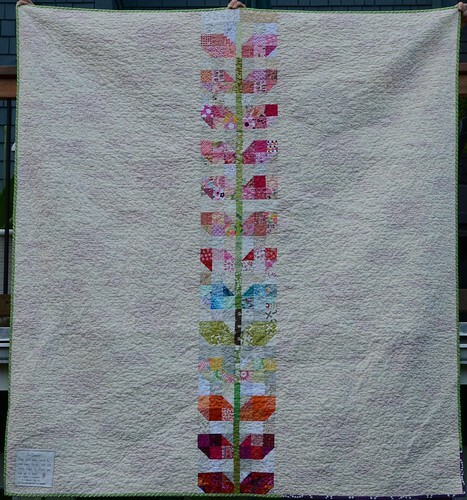 Congratulations, I am so glad that this quilt was picked to win it's category in the festival! 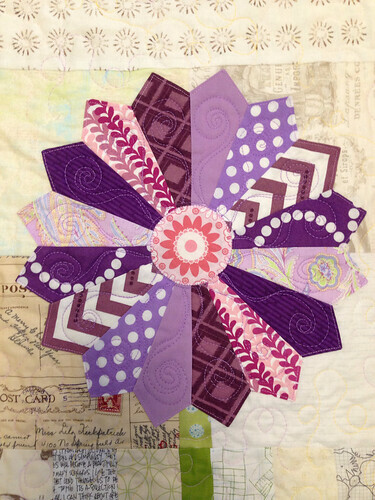 Congratulations on your win in the Bloggers Quilt Festival! It's already a special quilt, but this is the cherry on top!